We provide a complete wellness program for your pet to keep them happy and healthy. Our wellness programs are designed to prevent disease and prolong the lives of your companion animals. We strive to prevent illness whenever possible. Early diagnosis of illness can lead your pet to a longer, healthier life. Since our pets age quicker than us, regular exams are important to allow your veterinarian to evaluate your pet‘s overall health and become aware of any problems before they become serious illnesses. Our wellness programs include a comprehensive physical exam; internal parasite testing; heartworm and flea control; vaccination program; spay and neuter services; and specialized blood tests for all stages of life. It may seem like only yesterday that your pet was a playful puppy or curious kitten, but your pet’s health needs change as they age. Just like humans, pets need to visit their doctors more often as they get older to keep them healthy. For senior pets, prevention is important. Arthritis, skin conditions, difficulty with hearing or vision, kidney disease, diabetes, hypothyroidism, and hyperthyroidism are common among senior pets. Routine checkups, bloodwork, and other health screenings are important as part of their routine medical care. By detecting, treating, and preventing problems before they become life threatening, we can help to extend the life of your pet. We will work with you to design treatment plans, dietary changes, and modifications to your pet’s home environment to improve the quality of life for your pet. Congratulations on your new puppy! Our Puppy Wellness Program is designed to ensure your puppy is strong and healthy and will help set the foundation for your puppy’s long-term health. The first two to six months are a critical period in your puppy’s development. Puppies have weaker immune systems than adults and, as a result, are more susceptible to infection from diseases and parasites. Just as with human babies, puppies need to see their veterinarian on a more frequent schedule than do adult pets. Puppies need a series of vaccinations given 3-4 weeks apart, between the ages of 8 and 16 weeks. We will make sure your new dog is protected against rabies, distemper, and parvovirus, among other diseases. Whether your puppy was purchased from a breeder, adopted from a rescue group, or acquired from a friend or family member, puppies should get a physical on their first visit. Please bring a written record of any medical or vaccination history you received on your first visit. We will also check the puppy for intestinal parasites, fleas, earmites, and more. If possible, please bring a stool sample on your first visit to make this process easier. We will also discuss housebreaking, training, grooming, feeding, heartworm prevention, and spaying or neutering. We will work with you to provide you and your family the support and tools necessary to help your puppy grow into a well-mannered, healthy dog, including information and advice on nutrition, training, behavior, and socialization. Congratulations on your new kitten! Our Kitten Wellness Program is designed to ensure your kitten is strong and healthy and will help set the foundation for your kitten’s long-term health. The first two to six months are a critical period in your kitten’s development. Kittens have weaker immune systems than adults and, as a result, are more susceptible to infection from diseases and parasites. Just as with human babies, kittens need to see their veterinarian on a more frequent schedule than do adult pets. Kittens need a series of vaccinations given 3-4 weeks apart, between the ages of 8 and 16 weeks. We will make sure your new cat is protected against rabies, panleukopenia (distemper), FIV, and feline leukemia,, among other diseases. Kittens should always get a physical on their first visit. Please bring a written record of any medical or vaccination history you received on your first visit. We will also check the kitten for intestinal parasites, fleas, earmites, and more. If possible, please bring a stool sample on your first visit to make this process easier. We will also discuss housebreaking, training, grooming, feeding, and spaying or neutering. We will work with you to provide you and your family the support and tools necessary to help your kitten grow into a well-mannered, healthy cat, including information and advice on nutrition, training, behavior, and socialization. 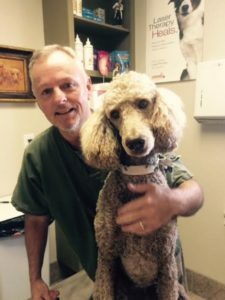 Dr. Carlton provides surgical services ranging from routine to advanced procedures including spays, neuters, mass removals, orthopedic, abdominal, reconstructive, and minor trauma surgery. Our surgical suite is equipped with state-of-the-art equipment and a fully trained staff to help ensure the safety and comfort of your pet during surgical procedures. Our veterinary team takes every precaution so that your pet receives the highest-quality care. We perform a physical exam and preanesthetic testing before surgery, monitor your pet during surgery, and provide appropriate pain medication to keep your pet comfortable during recovery. Our internal medicine service allows for diagnosis of most medical conditions affecting pets. We begin with a comprehensive examination. The examination findings are then used to determine a diagnostic plan that usually can be done in our hospital within one to two days. Our hospital possesses up-to-date diagnostic equipment including an complete laboratory, radiology (x-rays), etc. We offer therapeutic laser treatment for pain management. After an accurate diagnosis is made, our complete pharmacy allows us to begin treatment immediately, whether treatment consists of outpatient care or intensive care in the hospital. Radiology – or X-rays – help our veterinarians evaluate muscular-skeletal, cardiovascular gastrointestinal, dental, reproductive and urinary systems. Our in-house laboratory facilities provide for serum chemistry, hematology, serology parasite testing. We also utilize commercial veterinary laboratories for specialized diagnostics and consultations. A microchip is a small electronic chip about the size of a grain of rice placed under your pet’s skin. It is injected easily with a needle similar to a vaccination needle. Each microchip is identifiable by an individualized number registered in a pet tracking database service. If your pet should become lost and picked up or taken to a shelter or rescue group, they use a hand-held scanner to read the chip, contact the registration service, and contact you to reunite you with your pet. We provide high quality prescription diets to help maintain the health of your pet through all stages of life. Our trained staff is available to help you choose the right diet for your pet to keep him or her happy, healthy and active. 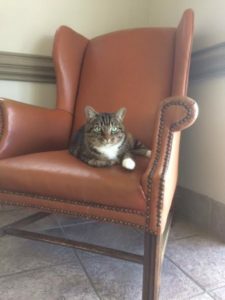 We offer nutrition counseling for dogs and cats in areas of obesity, growth, maintenance, reproduction, as well as prescribing special foods to aid in the control of allergies and specific medical conditions. We will provide guidance regarding your pet’s nutritional needs for each life stage, including dietary requirements for growth, weight maintenance and performance. Fleas are tiny pests that can do more than just irritate your pet. Despite their minuscule size, they can cause large problems for you and your pet. From minor skin irritations to much more severe medical problems like anemia due to blood loss from bites, severe skin irritations to allergic reactions, as well as various diseases transmitted by these tiny parasites. To keep your pets comfortable and healthy, prevention is key. Today, there are a number of alternative methods to keep fleas off your pet and out of your home. We will work with you to select the proper products and regimens to keep you, your pet, your family, and your home flea-free. Bathing is an important part of the health of your pet. We offer bathing services for both dogs and cats. Our baths will remove dirt, debris and that doggie/kitty odor. Your pet will leave feeling refreshed and smelling and feeling great! If scratching is a problem, our medicated baths contain soothing agents to help stop the itching. Nail trims and ear cleaning can be added for an additional price. We are committed to reducing pet overpopulation, but we are even more committed to keeping your pet strong and healthy for the duration of its life. Spaying (for female pets) or neutering (for male pets) is one of the best ways to keep your pet healthy and avoid unnecessary health problems now and later in life. We do our best to make these services an affordable preventative measure for our clients. Spaying females prior to their first heat cycle nearly eliminates the risk of breast cancer. In addition, spaying also helps prevents uterine infections and uterine cancer. Neutering males prevents testicular cancer and enlargement of the prostate, and greatly reduces their risk for perianal tumors as well as reducing aggression and marking and roaming behavior. Essentially allowing your pets to be spayed or neutered will enable them to fulfill a long, healthy life.